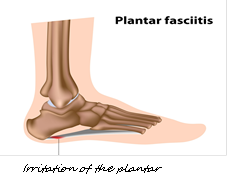 Caboolture Physical Therapy Centre > Blog > Physiotherapy > Plantar Fasciitis – What is it? The plantar fascia is a fibrous band on the underside of the foot that helps support the arch and deep muscles of the foot. Often over time, the stress that is put upon the plantar fascia becomes too much and it begins to degenerate, causing pain when the foot is placed on the ground. It is actually a breakdown of the fascia tissue, which develops many micro-tears. It is thought that as these tiny tears heal, scar tissue is laid down, making the fascia less flexible, which in turn contributes to the overall problem. In some cases patients will also develop bony deposits in the fascia at the heel, called heel spurs. This is a progressive condition but also a self-limiting one. This means that it starts gradually, becomes worse and then eventually resolves itself. Without treatment, however, the condition can take up to two years to go away and is extremely painful. The first symptoms are a slight pain on the inside of the heel in the mornings; usually the first steps of the day are the most painful. As the condition progresses there may be pain with walking or running and eventually after activity as well. In severe cases pain might be felt all the time, even when resting. For athletes it is likely that the problem is caused by training program errors, poor biomechanics, tight calves and inadequate support in footwear. In other people, it’s more likely that the problem is caused by standing for long periods on hard surfaces, increased age, changing from regularly wearing high heels to flat shoes, tight calves and unsupportive foot wear. Plantar fasciitis has also been linked to obesity or weight gain. Your physiotherapist can diagnose the problem by examining the area. Usually a description of symptoms and physical evaluation can be enough. The first stage of treatment will involve identification of contributing factors and pain management. Your physiotherapist can apply taping techniques to unload the fascia and use hands on techniques to restore flexibility to the calf muscles and fascia. This can provide great relief of pain, particularly in the early stages of treatment. They will also advise you on a suitable training program, correct footwear, home exercises and stretches, specifically calf and plantar fascia stretches. They can also help make modifications to your running style if this is contributing to the problem. There are surgical options for heel spur removal and steroidal injection however the evidence for these treatments doesn’t show a lot of advantage over physiotherapy at this stage. If you have any questions, don’t hesitate to ask your physiotherapist at your next appointment.